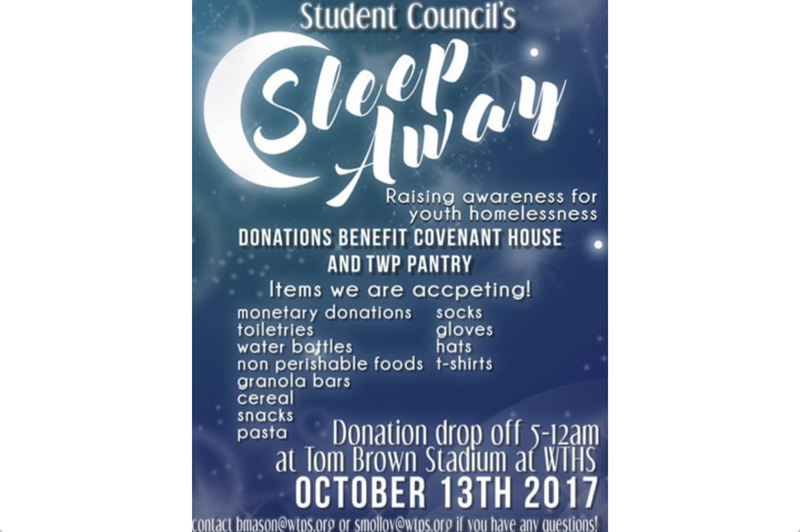 The gesture will be more than symbolic when approximately 36 members of the Washington Township High School Student Council and their advisors, Brittany Mason and Shannon Molloy, host a “Student Council Sleep Away” to raise awareness and funds for area homeless youth. The group will be pitching tents on Friday, Oct. 13, at the school’s soccer field, adjacent to Tom Brown Field, beginning at 5 p.m., and accepting donations until midnight before sleeping out for the remainder of the night. Monetary donations will be given to Covenant House, an organization that provides resources and housing to homeless youth in the area. Additionally, the group will be accepting supplies (i.e. toiletries, water bottles, non-perishable food, granola bars, cereal, snacks and pasta, as well as clothing including socks, gloves, hats and t-shirts) that will be donated to the WTHS pantry for students in need in the school. Donation boxes also will be available in the main lobbies of the WTHS nine-10, core and 11/12 offices. For additional information, please contact Brittany Mason (bmason@wtps.org) or Shannon Molloy (smolloy@wtps.org).